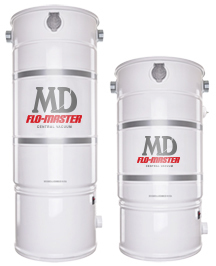 Flo-Master Central Vacuum Customer Ratings and Reviews - MD Vacuum. Puts my old Housekeeper 3000 unit to shame. Possibly the BEST VACUUM EVER. It?s mounted on the outside wall of my husband?s office and he can use the phone while the vacuum is running..incredible quiet! I only wish we had replaced it sooner. Just started using the unit today. It seems light weight, easy to maneuver and is quiet. Replaced old central vacuum unit when the motor wore out with an MD Flowmaster. Our installer chose this one for us. It is a much better unit than the old one and has much more suction and the filter is easier to change out. Great customer service people at the plant. I replaced my 35 year old bottom filter power unit with the top filter Flow-Master unit. What a treat it will be to unload and replace new filter bags in the future. This was extremely easy to install. I particularly liked the bar that screws to the wall to hold the Central Vac Power Unit in place. It has a lot more suction than my old unit and is much more compact in height. Looking forward to many years of use. I has also purchased a few accessories to use for our hardwood floors. Great customer service on the phone to help select replacement power unit - personal, patient, listening to understand and meet my needs. I wasn't sold the most expensive, but rather what would serve me best. Power unit is high quality. Great power - way above my previous unit. Installation very simple and bag installation - exactly according to instructions. I love this company! I had a central Vacuum for 22 years and just replace it with the Flo-Master. I love the suction power of this new unit. MD Central Vacs has fabulous customer service and the units work very efficiently. This is the first time we've had a central vacuum. What were were waiting for? The Flo-Master came with our new house, and it is working out very well. Very easy to install. Much quieter than my old Nutone, and more power. Plenty of power, much more than Filtex it replaces. I just had a flo-master central vacuum installed in my home and I am thrilled with the results. The machine is quiet, powerful, and very well built. I am looking forward to using it for years to come! GOOD CLEAN LOOKING UNIT THAT FUNCTIONS VERY WELL, QUIET AS FAR AS CENTRAL VACS GO, DOES THE JOB, AND EASY TO EMPTY WITHOUT A MESS.